Anthesis (Flowering) in Wheat. Posted on May 30, 2013 by ipcm-edit. Shawn Conley, Soybean and Wheat Extension Specialist. Dr. Shawn Conley, the Wisconsin soybean and small grains Extension specialist, visits a wheat field to demonstrate the process. 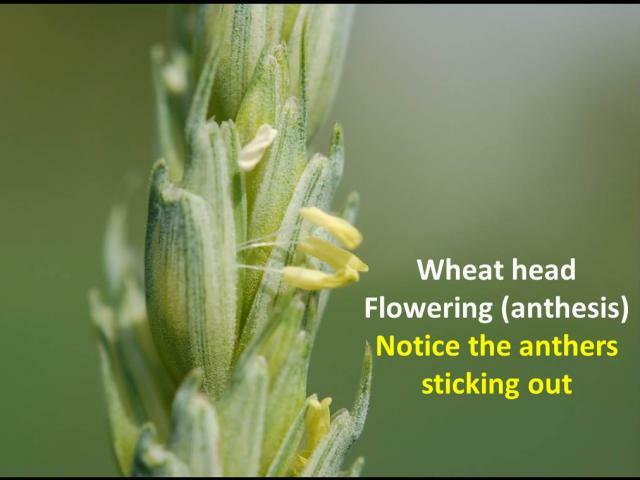 To view the video click on the image below: Flowering in Wheat. In France, the recommendation for the first nitrogen application on wheat is 6 weeks before Z30, with the second application on Z30. Wheat growth regulators are typically applied at Z30. Disease control is most critical in the stem extension and heading stage (Z31, Z32, Z35), in particular as soon as the flag leaf is out (Z37).